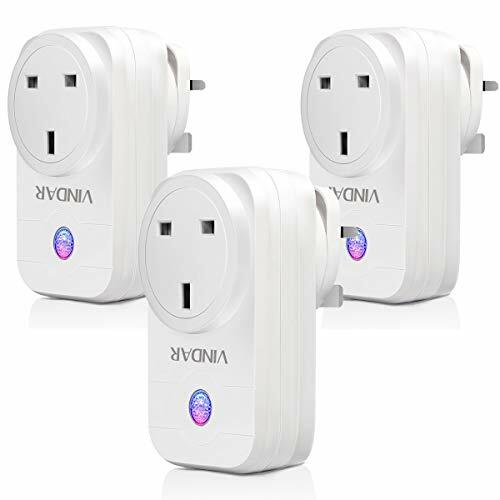 - [Widely Compatibility ]: The Wifi Smart Plug Compatible with Amazon Alexa (Echo and Echo Dot) and Google Home/Assistant for voice control and IFTTT for voice control, assign a name to each Smart Plug and communicate each plug by name when making a voice command, instantly turn on or off devices by voice control. - [One "eFamilyCloud"APP for All]: Scan the QR code or enter "eFamilyCloud"in the app store of your cellphone to downlode the APP. You can monitor all of your connected devices and turn them on/off anywhere and anytime through the free app on your smartphones or tablets of both Android or iOS (Android 4.4 or higher and IOS 8.0 or higher ). - [Timing setting]: It can schedule Smart Outlet to automatically power electronics on and off based on specific time you set, Turn on/off the light, air-conditioner, power charger or Water heaters automatically after set the specific time. It can support 20 groups timing set. - [No hub required]: Our smart plug support 2.4G WIFI only, not support 5G WIFI. It works with any Wi-Fi router without the need for a separate hub or paid subscription service and compatible with all VINDAR smart home devices, allowing you to easily control your home from any Android or iOS device.